"Me and my friend wanted dessert, so we went to the kitchen and made this. It is one of my favorite sweet treats, and I am sure you will enjoy it. I recommend having it with soft pretzels and milk." 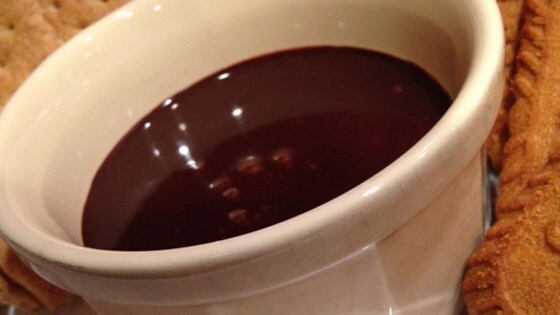 Combine chocolate-hazelnut spread, milk, honey, and vanilla extract in a small microwave-safe container. Heat in microwave oven for 1 minute. Stir the dip with a toothpick until somewhat smooth; let cool for 2 minutes before eating. For a thicker sauce, use cream instead of milk. For a thinner consistency, add more milk after cooking and stir. For a thicker consistency, add more Nutella® after cooking and stir. Awesome. Made it with some homeamade pretzel ans kids loved it. Recipe worked great - no changes. I made homemade zeppole and dipped in this. Was great!